The announcement came late last week, but just in case you missed it Wiley publishing will provide Autodesk Official Training Guides for Autodesk’s 2011 products. Ten titles from Sybex, an Imprint of Wiley, will be exclusively designated as “Autodesk Official Training Guides”. 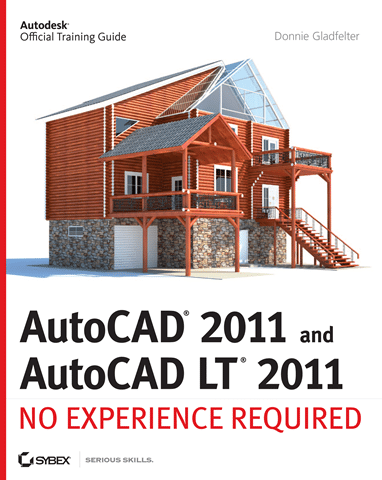 I’m excited to announce my upcoming book AutoCAD 2011 and AutoCAD LT 2011: No Experience Required was among the titles to receive this designation. I just recently finished reviewing the last of the page proofs for my book, and let me say the folks over at Wiley did an incredible job at assembling the manuscript! I’ll write a more in-depth post once the book is actually released, but my editorial team, which included fellow blogger Melanie Perry (aka Mistress of the Dorkness) as my technical editor, consistently impressed me throughout the entire project. 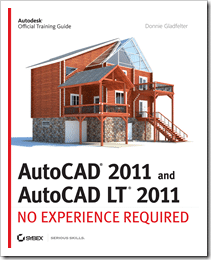 You can expect AutoCAD 2011 and AutoCAD LT 2011: No Experience Required to hit bookstores next month (June 2010). Its 950+ pages cover a long list of features which are complimented by best practices taken straight from industry ensuring you’ll be productive applying each of the concepts you learn. The book also employs the increasingly popular U.S. National CAD Standards currently in use by many top architecture and engineering firms. If not in the classroom of an Autodesk Authorized Training Center, I certainly hope you’ll have a look at the book once it’s released next month. Likewise, I invite you to contact me if you’re looking for a CAD Manager or trainer to work with the CAD professionals within your firm. I recently purchased this book, mainly to become more informed about 3D. I am skipping ahead to chapter 16 – Creating 3D Geometry. On page 833 under the heading of “Setting up a 3D workspace”, it says to start by opening the file 15A-FPLAY1.dwg – using the provided link to Sybex.com. I have looked in the download section of that website for the book and I am not able to find that file. I find the 14A-FPLAY1.dwg and the 16A-FPLAY1.dwg, but not the 15A-FPLAY1.dwg. Can you tell me if this file exists and how I can obtain a copy? Thanks so much.